Once a medical rarity in children, inflammatory bowel disease (IBD) is increasingly common in kids today. 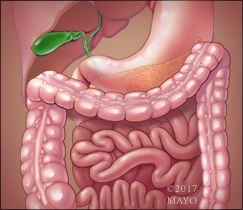 Patients who are diagnosed with this disease at a very young age, sometimes less than 6 years old, have what is known as very early-onset IBD (VEO-IBD). Mayo Clinic gastroenterologist, Michael Stephens M.D., discusses a study published in The Journal of Pediatrics, that evaluates the diagnosis, management and long-term outcomes of children with very early-onset IBD. The study found that children with VEO-IBD can present unique challenges to physicians and health-care providers. It starts as a relatively mild disease, and tends to be isolated to the large intestine. Over time, however, it changes in behavior, becoming more severe, and involving other regions of the intestine. VEO-IBD is appearing more frequently on physicians' radars, and it is important to recognize that children are not small adults. Many of the children have definable problems with their immune system, and collaborating with good immunologists, as well as advanced genetic testing can facilitate more customized and enhanced treatment. Dr. Stephens is a gastroenterologist at Mayo Clinic.